So long Windows Phone, hello more cross plat! Me: Strange let me look into it. Me: When are you going to fix it? MS: Never, please rewrite your apps to work around it. This was a recent exchange I had regarding a problem with My Trips live tile. It’s a painful problem for my ardent users of My Trips, many of whom have been using it since I first brought it out for Windows Phone 7 many years ago. It’s an interesting predicament for me. I appreciate the users of My Trips, but I don’t appreciate being told I need to rewrite part of the app to use new APIs to work around this bug. Microsoft has always been very focused on backwards compatibility and this flies in the face of that. Sure, my app code is old. I wrote it with C# and XAML but back when Windows Phone used a Silverlight app model … so it is not a more modern Windows universal app. What ticks me off is I have supported the platform for years and created a reasonably popular app that filled one of the app gaps in their ecosystem. You would think that given the widening app gap that MS would bend over backwards to ensure app developers were sticking on the platform. It seems not. It sounds like there are very few apps hitting this bug and for that reason they are not going to fix it. Although this irritates me, im sure it irritates and frustrates the users more. For me the equation is pretty simple. Time to update the app vs. return, and to be honest it doesn’t make sense given the time I would need to put in to change this code. Side note for those interested on the code changes needed: It’s not a couple of lines of code to change, it’s quite a bit. It’s changing how the app generates tiles and how it registers for push notifications from Microsoft. But I am conflicted. Because I know there are still die hard Windows 10 mobile fans out there that will not like me for abandoning the app. That pains me. I have wanted to update My Trips for Windows 10 (for desktops, tablets etc…) for a while and I would much rather put effort into that. Now that Xamarin is in the MS family and I could quite easily target a version for iOS and Android at the same time whilst sharing 80% of the code. Now that Xamarin is in the MS family and I could quite easily target a version for iOS and Android at the same time whilst sharing 80% of the code. So with all this said I am pretty sure I am leaving the My Trips mobile code alone to wither and die. It’s been a great ride. I have wanted to bring it to iOS for a long time, especially since I’m an iOS user these days and I have had a bunch of requests for it. So hopefully I can get that done and keep My Trips an app with a future. This entry was posted in Development, Windows Phone on February 28, 2016 by Chris Johnson. Anyone who has listen to me rant on about how interesting Docker is on the Microsoft Cloud Show may have caught me talking about Tutum. 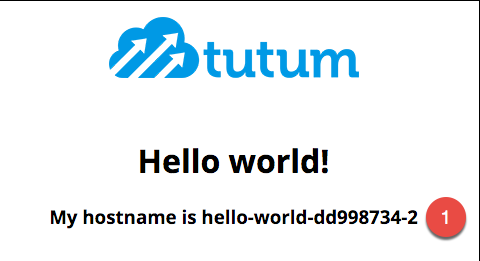 The short story on Tutum is that it provides an easy to use management application over Virtual Machines that you want to run your apps on with Docker. It is (sort of) cloud provider agnostic in that it supports Amazon Web Services, Microsoft Azure and Digital Ocean among others. 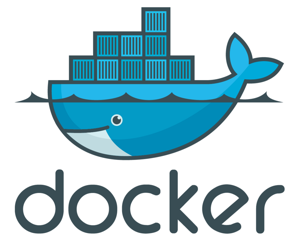 It was bought by Docker late last year and recently was recently re-released as Docker Cloud. At a high level you still pay for your VMs wherever you host them, but Docker Cloud provides you management of them for 2c an hour (after your first free node) no matter how big or small they are. You write your code, package it in a Docker Image as per usual and then use Docker Cloud to deploy containers based on those docker images to your Docker nodes. 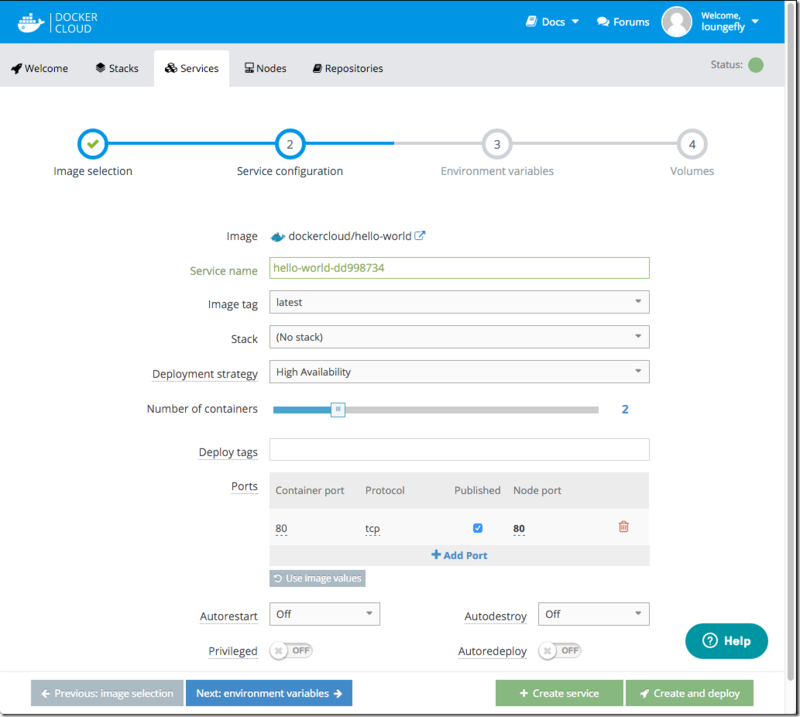 You can do this manually or have it triggered when you push your image to somewhere like Docker Hub as part of a continuous integration set up. Once you have deployed your app (“Services” in Docker Cloud terminology) you can use it to monitor them, scale them, check logs, redeploy a newer version or turn them off etc… They provide an easy to use Web App, REST APIs and a Command Line Interface (CLI). So how easy is it really? Once you have done that you can start deploying Virtual Machines, “Nodes” in Docker Cloud terminology. Below I’m creating a 2 node cluster of A2 size in the West US region of Azure. That’s it. 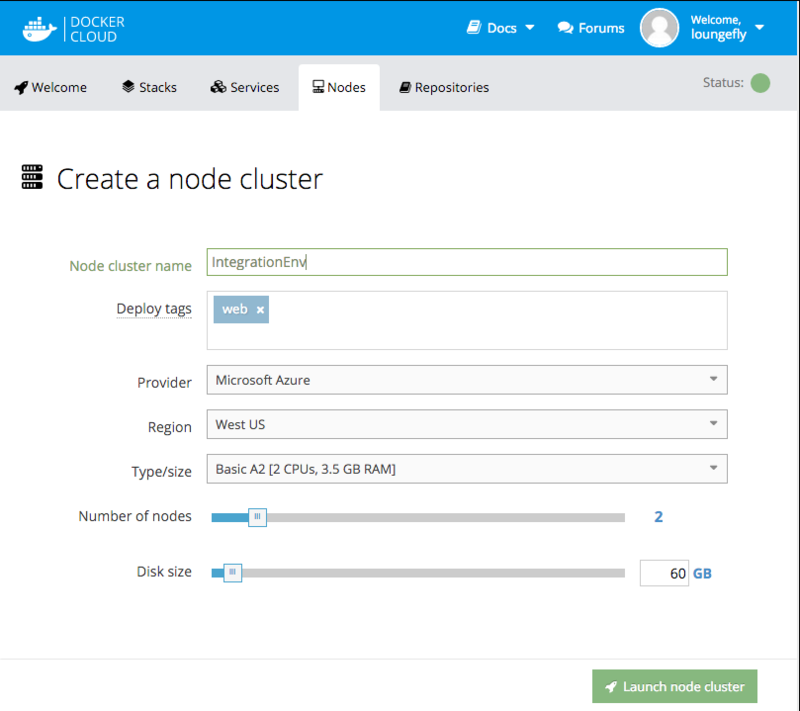 Click “Launch node cluster” wait a few mins (ok quite a few) and you have a functional Docker cluster up and running in Azure. 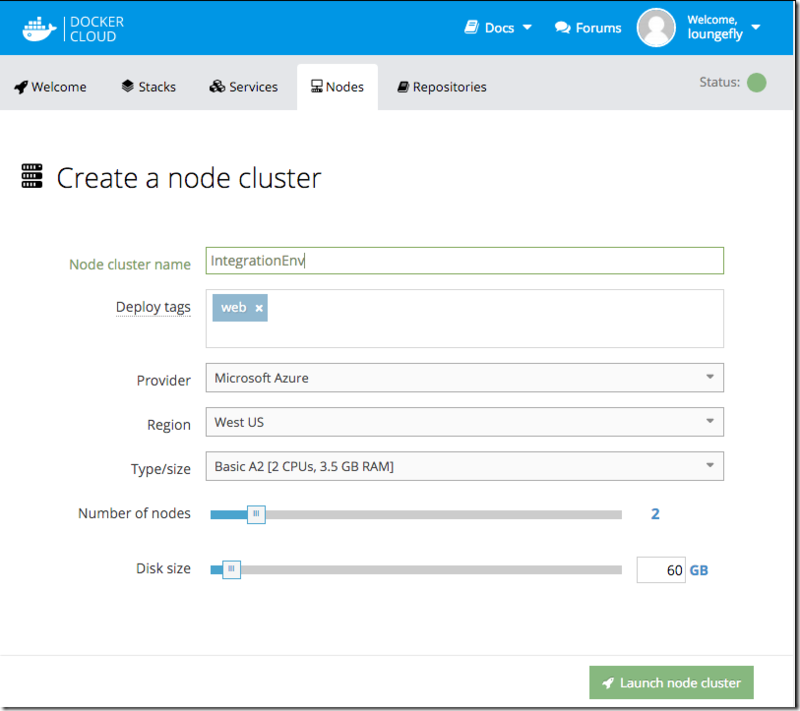 In Azure you can take a look at what Docker Cloud has created for you. Note that as of the time of writing that Docker Cloud is provisioning “Classic” style VMs in Azure and not using the newer ARM model. They also deploy different VMs into their own cloud services and resource groups which isn’t good for production. That said, Docker Cloud let you Bring Your Own Node (BYON) which lets you provision the VMs however you like, install the Docker Cloud agent on them and then register them in Docker Cloud. Using this you can deploy your VMs using ARM in Azure and configure them however you like. 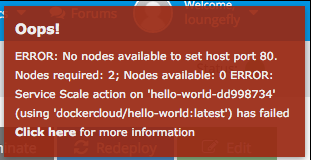 Now you have a node or two ready you can start deploying your apps to them! Before you do this you obviously need to write your app … or use something simple like a pre-canned demo Docker Image to test things out. Docker Cloud makes this really simple through “Services”. You create a new service, tell it where it should pull the Docker Image from and a few other configuration options like Ports to map etc… Then Create and your containers will be deployed to your nodes. There are only a two things I changed from the default setup. Mapped Port 80 of the container to Port 80 of the node and clicked Published. This maps port 80 of the VM to port 80 of the container running on it so that we can hit it with a web browser. High availability in the deployment strategy. This will ensure that the containers are spread across available nodes vs. both on one. Click “Create and deploy” and you should see your containers starting up. Pretty simple huh! Note: There is obviously a lot more available via configuration for things like environment variables and volume management for data that you will eventually need to learn about as you develop and deploy apps using Docker. I want to see the good man! 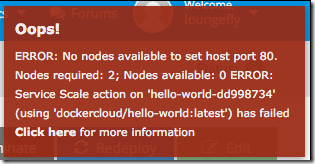 You can test your hello world app out by hitting its endpoint. You can find out what that is under the Service you created in the Endpoints information. This is the service endpoint. It will use DNS round robin to direct requests between your two running containers. These are the individual endpoints for each container. You can hit each one independently. Note that #1 will indicate what container you are hitting. Want more containers? Go into your Service and move the slider and hit apply. This is because we mapped port 80 of the Node to the Container and you can only do that mapping once per Node/VM. i.e. two containers cant both be listening on port 80. So unless you use a HAProxy or similar to load balance your containers you will be limited to one container on each node mapped to port 80. I might write up another post about how to do this better using HAProxy. We are a small company and we want to automate things as much as possible to reduce the manual effort required for mundane tasks. We have opted to use Docker Cloud for helping us deploy containers to Azure as part of our continuous integration and continuous deployment pipeline. Travis-CI.com is notified and it pulls the code and builds it. Once built it creates a Docker Image and pushes it to Docker Hub. Docker Cloud is triggered by a new image. It picks it up and redeploys that Service using the new version of the image. This way a few minutes after a developers commits code the app has been built and deployed seamlessly into Azure for us. We have a Big Dev Ops Flashing Thing hanging on the wall telling us how the build is going. Is this how you will run production? Not 100% sure to be honest. It is certainly a fantastic tool that helps you run your apps easily and quickly. But there is a nagging sensation in the back of my head that it is yet another service dependency that will have its share of downtime and issues and that might complicate things. But I guess you could say that about any additional bit of technology you introduce and take a dependency on. That said, traffic to and from your apps is not going through Docker Cloud, traffic goes direct to your nodes in Azure so if they have brief downtime your app should continue to run just fine. I have said that for the size we currently are and with the team focusing on building product that we might consider something else only once we can do a better job that it does for us. We might consider something else only once we can do a better job that it does for us. All in all I think Docker Cloud has a lot of great things to offer. It will be interesting to compare and contrast these with the likes of Azure’s new service, Azure Container Service (ACS) as it matures and approaches General Availability. It’s definitely something we will look at also. This entry was posted in Azure, Cloud, Cloud Management, Development, Docker on February 21, 2016 by Chris Johnson. One of the pet peeves we heard no end of complaints about when i was at MS was the lack of a decent Change Log. Even just one targeted at developers. It might seem strange to people why MS haven’t done that for the whole of Office 365, but lets just say its a really hard nut to crack. That said the great team working on the Microsoft Graph (graph.microsoft.com) APIs have been doing a nice job on the Office dev blogs keeping us up to date on changes going on in the run up to the APIs release last week. The document can be quite large and manually finding changes in it is pretty painful. Diff to the rescue! You can use your favorite diff tool to see what has changed from one copy to the next. GitHub also does reasonable diffing. I am going to try and keep a copy of the $metadata document in GitHub that people can take a look at. 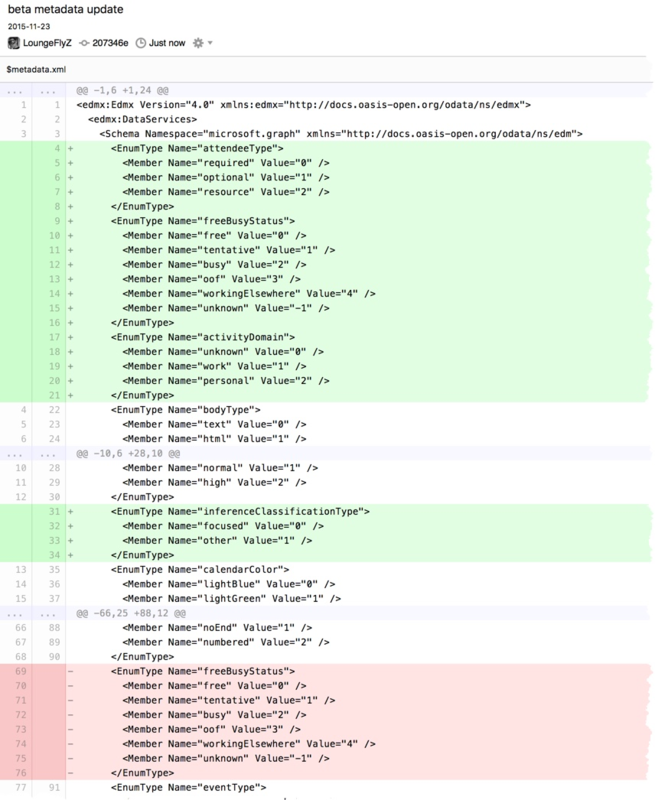 Here is a link to the current diff between the /v1 API and the /beta API as of Nov 23 2015. This entry was posted in Development, MS Graph API, Office 365 on November 23, 2015 by Chris Johnson. 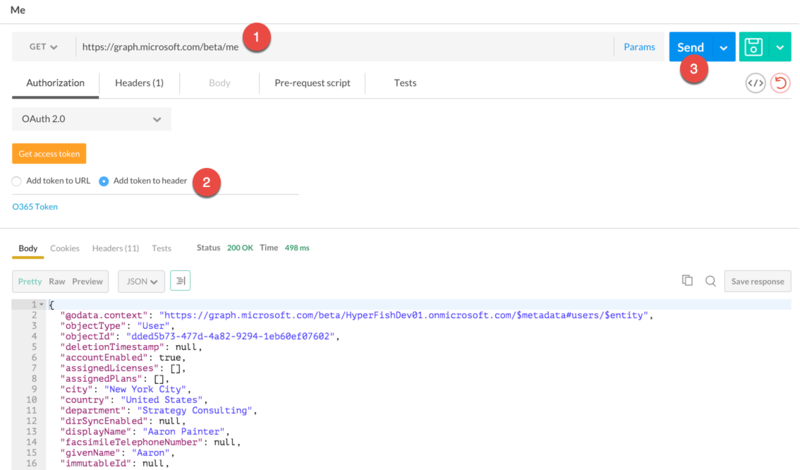 The Office 365 Unified API at graph.microsoft.com is a nice API to work with Azure AD and Office 365 from a single API endpoint. Authorized via OAuth 2 flows and all REST/JSON etc… Pretty much as you would expect as a developer. There are a few ways to play around with the API. Postman is pretty slick. It lets you craft HTTP requests, their headers, parameters, body etc… and get responses back formatted in various ways. 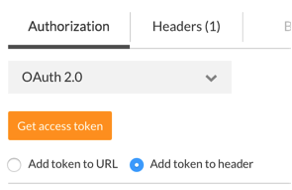 Postman 3 also supports OAuth 2 flows to help simplify the process of authenticating against and API, so you dont need to do all the various hops and token copying between requests. 4. Next you need to go and register an app, if you haven’t already, in order to get a Client ID and Secret. There are instructions on doing that here. When complete make a note of the client id and secret as you will need them shortly. Notice at the end of the Authorization URL you need to include the “resource” parameter. 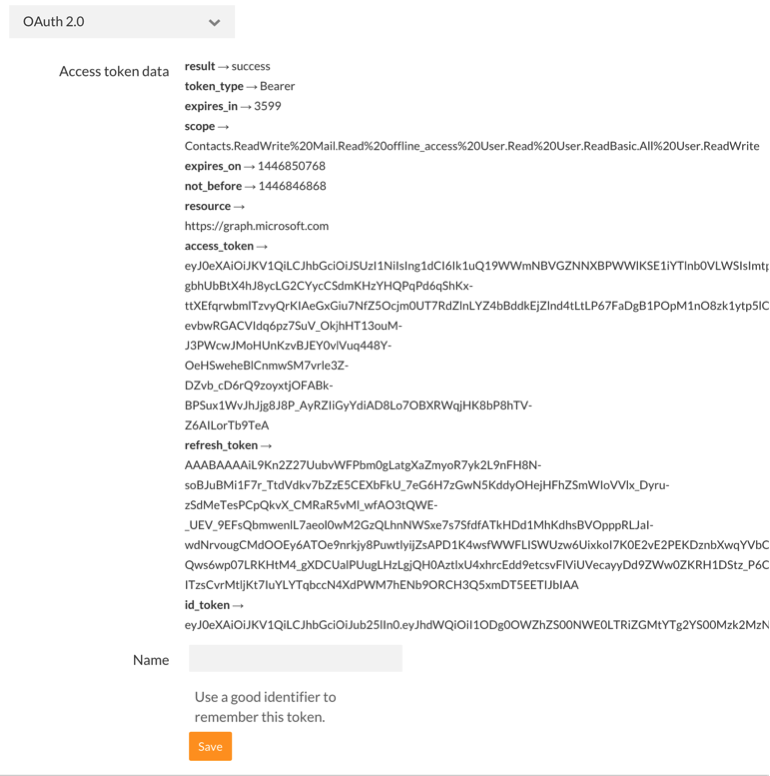 This is required with O365 and indicates what endpoint you are trying to get access to. 6. Click the “Get access token” button to initiate the authentication and authorization flow. Postman will pop up a window that will direct you to log into Office 365 and let you consent to the application being given the appropriate privileges. When complete you will see the OAuth access token, scopes etc… that were returned. Type in a name for this token and save it. Then for all subsequent requests you can attach that token to your request like this. All things going well you will get back a nice JSON response with your profile information included. Hopefully helps simplify calling the graph.microsoft.com endpoint, playing with requests and not having to deal with all the icky OAuth goo along the way. This entry was posted in Development, Office 365 on November 6, 2015 by Chris Johnson. A while back I heard about Big Flashing DevOps Thing which shows you how to build a LED sign using a Raspberry Pi + BlinkyTape to display the current status of your build/deployments. Pretty cool! But at Hyperfish we are using Travis CI for our builds/tests, not Jenkins that the provided code currently supports. The bash script simply downloads this feed, parses out the relevant information and then writes the appropriate color settings for the LEDs to a log file. If the script sees the build is working it writes a number corresponding to Green in the log file. It does this for however many repos you want to monitor. Here is a short video of my BlinkyTape updating status and setting the lights. In my case I set it up to monitor 3 repos in Travis, so the tape is divided into three sections to show status for each one. This all requires a working Raspberry Pi and a basic knowledge of running scripts in Linux. In my case I am running it with Raspbian (a Linux distro for the Pi). This entry was posted in Development on October 17, 2015 by Chris Johnson. Back in 2007 I was looking to move to the US and join the SharePoint engineering team. 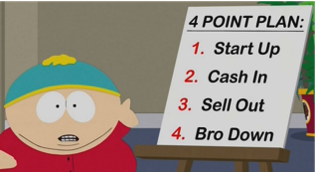 As part of the early initial email based discussions about the role the guy I was talking to about a job asked me to list off some things I think were needed for SharePoint development. I recently stumbled on the OneNote page where I was jotting down some notes before I sent him the email. Web Services that take/return object friendly OM friendly data …datasets etc… + keep XML document based ones. #1 – Remotable APIs … this would become the Client Side Object Model in SharePoint 2010. #2 – FP RPCs … this would be the ability to better interact with files and folders etc… via the CSOM. #3 – Web Services with friendly data – this would become the first ListData.svc REST/OData endpoint in SharePoint 2010. Finding these notes was pretty nostalgic really! It’s hard to imagine development in SP without some of these things now … especially the REST services considering how far they have come now! It’s also interesting in that these were really the first investments in helping developers get code off the SharePoint server. Before this as a developer you really had to create and deploy your own web services and use the SP server side object model (yuck!). What would be the four things you would write on your list today? Comment below! This entry was posted in Development, SharePoint on December 28, 2014 by Chris Johnson. I had a chance to sit down with Rob Howard on the Office 365 Developer Platform team here at Microsoft and ask him about his history with SharePoint, what’s changing about the way MS builds products now we live in a services/cloud world and throw in a question about what the one thing he would change in SharePoint if he were to do it again. Rob and I get to work together a lot at Microsoft and he is one of the nicest and most knowledgeable people on all things Office 365 / SharePoint development. This entry was posted in Development, Office 365, Podcast on July 1, 2014 by Chris Johnson. I’m heading to the Build conference next week in San Francisco, YAY my first //build ever. We have a bunch of great developer related content for SharePoint and Office 365 there. Don’t worry if you have not developed for SharePoint or 365 before, there is content to get you up to speed! Also Office 365 will have a booth so come and visit the booth and connect with the speakers and the team from Redmond. This entry was posted in Conferences, Development, Office 365, SharePoint on March 26, 2014 by Chris Johnson. It’s been a long time coming and widely anticipated that this announcement would come at some point. It’s great to see the announcement and the clarity many have been asking for. I feel like I’m in a good position to comment on this and give some background about why I think deprecating code based sandbox solutions is good idea. I was on the SharePoint engineering team when the sandbox was being built and for a period of time I was the Program Manager for the feature. Background: Sandbox solutions in SharePoint were introduced in SharePoint 2010. They allowed a packaged set of assets and code to the uploaded to a SharePoint site. That can consist of declarative components like XML for adding things like List Templates, as well as compiled code for things like Web Parts or Event Receivers. When the Sandbox was being designed and built it was about 2 – 3 years prior to SharePoint 2010 being released. Azure, and cloud computing in general, either didn’t exist or was in its infancy. SharePoint needed a way to upload customizations/components to SharePoint sites where the administrators were not comfortable with installing Farm Solutions aka. Full trust solutions. Microsoft itself was a perfect example of this. If I built a web part I, as a Microsoft employee at the time, couldn’t load that onto our SharePoint sites that MS IT ran. No 3rd party web parts or products. This was a common problem in many large organizations and we heard about this time and time again with customers. Sandbox Solutions were the answer. They allowed users to upload a solution and have SharePoint run it while it being controlled, secured and run in a sandboxed process. The main thing this gave SharePoint was the ability to isolate the code in that solution and ensuring that if it crashed or was badly behaved that it didn’t break the rest of the SharePoint environment. The problem was that Sandbox Solutions was a feature added in Windows SharePoint Services (WSS) and that was a different product from SharePoint Portal Server (SPS) that built on top of WSS. The API set in the Sandbox that was available was limited to WSS APIs and even then only a subset of them. There were good reasons for this, but at the end of the day it was very limiting for people. Ideally it would have been great to have lots of SPS APIs available too. But that didn’t happen (different story). So that is the background about how/why Sandbox came about. In a nutshell the Sandbox was a good solution to the problem faced when it was designed. However, it’s not a great solution to the problem given the technology we have today. Why is it no good today you ask? A lot happened after the Sandbox was designed and built. Cloud computing took off, new advances in code in all sorts of places got easier e.g. isolated apps on a phone. A lot was learnt. In short its my belief that SharePoint shouldn’t have been trying to replicate an isolated code hosting environment. That is reinventing the wheel and there are other teams at MS who build products to do this extremely well already. Namely IIS and Azure. So today MS clarified that SharePoint was getting out of the code hosting game. Why? Because it was limited and there are better solutions to this problem today. The new SharePoint app model is designed to solve this by moving “sandbox” code to an alternative host e.g. IIS or Azure or <insert thing that runs code here>. Sandbox code might be “dead”, but the new app model IS the new Sandbox! I see the reasons why the sandbox came about the same as I do for the new app model. They are solving the same problem. How do you allow someone to customize, extend and build new things on SharePoint without compromising the integrity of SharePoint itself? That is the goal. Today in SharePoint 2013 and Office 365 we have the ability to build solutions that use this new app model. Sure, it’s not perfect in the APIs it provides and there is plenty of scope for adding things. I am certain it will evolve to cater for more of these things over time. That said, it is MUCH better suited for the long term. I for one am loving the ability to use all the latest dev tools and technologies in Azure that were not possible in SharePoint previously. The app model may not be applicable or possible to be used for everyone today and that is fine. It’s going to develop and that will change over time would be what I bet on. But it is the right path moving forward. This might cause some pain for people in the short term and I understand the frustration people have with changes like this. But I would MUCH rather have to deal with this change than be limited to a inferior set of capabilities in the longer term. This is the right move long term (in my humble opinion). Short term pain, long term gain. Getting SharePoint out of the code hosting solution was the right things to do and I applaud the team for clarifying there position on this. I look forward to the SharePoint Conference in March where hopefully (fingers crossed) we will hear more about the future of the new app model and how it will address its shortfalls today. This entry was posted in Azure, Cloud, Development, Office 365, SharePoint on January 15, 2014 by Chris Johnson. One of the big problems developers and organizations have using cloud services like Azure is the potential for the costs to go crazy if you don’t shut your dev, test or temporary Virtual Machines off. Sometime back Andrew Connell and I got talking about and had an idea for an online service that would help you manage those costs. We talked with some people and found found loads of people that were concerned with using Azure and Amazon Web Services because of these cost overrun type of issues. So we decided to fix it … Introducing Kerrb. Kerrb is a SaaS product designed to save you money by automatically turning off Azure VMs that you forget about. If you forget to turn off a virtual machine Kerrb will make sure it’s turned off on a schedule that you decide on. Kerrb is still being built, but you can sign up for the launch list and be one of the first to get access when it is ready. We will send you updates on how development is progressing and finally give those on the launch list the opportunity to sign up and test out the system when it’ ready. Also as an added bonus, if you are on the launch list then we will honor the pricing we have up on the site, even if we decide to tweak it prior to launch. Kerrb will start small and evolve quickly as demand and feedback drives the product development. The high priority “Pri 0”  feature is to turn off Virtual Machines in Azure if you forget, but we have a lot of other great features on the roadmap including adding Amazon Web Services as well as support for other leading cloud providers. We look forward to hearing your comments and feedback! Pri 0 – Microsoft speak for the highest priority features in product development. You have to have all the Pri 0’s. This entry was posted in Azure, Cloud, Cloud Management, Development on November 12, 2013 by Chris Johnson.